It's only taken 38 years. With the new X-Class stealing all the limelight this week as Mercedes’ first ever pickup truck, the German automaker doesn’t want to neglect its long-standing luxury offroader. While we’re still waiting for the redesigned model to arrive, the iconic G-Class has just celebrated a new production milestone, as the 300,000th model has rolled off the assembly line. To mark the occasion, the design of this celebratory SUV was influenced by fans around the world, who voted for their favorite specification on Facebook. The 300,000th G-Wagon is packed with a 4.0-liter twin-turbocharged V8 engine and finished in Designo Mauritus Blue Metallic with black leather seats and contrasting white stitching. It also features the Off-Road package, which includes black 16-inch wheels with all-terrain tires and a roof rack. A customer won’t have the privilege of owning the landmark off-roader, but it will be prominently displayed on Mercedes’ social media channels, where you’ll be able to track its off-road adventures with the hashtag #Gventure300K. “The production of 300,000 G-Class models is an impressive milestone," said Dr Gunnar Guthenke, head of the off-road product group at Mercedes-Benz. "The team which has contributed substantially to this success includes employees who have been part of the story of the G-Class for 38 years,” he continued. 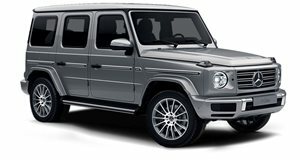 “We have enjoyed decades of successful cooperation with Magna Steyr in the production of the G-Class.” 300,000 sales in 38 years may sound like a relatively modest achievement when compared to some of its rivals like the iconic Land Rover Defender, but the G-Wagon has become increasingly popular in recent years. Every year, the G-Class has achieved record sales since 2012, culminating with 20,000 units sold last year for the first time. Since the G-Class started production in 1979 in Graz, Austria, the design and architecture has remained largely the same ever since apart from a few minor modifications. That will finally change at this year’s Frankfurt Auto Show in September, where the all-new G-Wagon will be revealed with the first redesign in nearly 40 years, which should hopefully increase sales momentum.